So, you've just bought an E-Bike and want to know more about how to keep the bike in tip top condition? We've spoken to our E-Bike experts both in-store and at our head office to find out how to maintain your E-Bike. From cleaning to monthly checks, make sure you're doing everything you can to keep your bike in the best possible shape. Charge your battery regularly. This may seem like an obvious one but make it a habit to always recharge your bike after a ride, or at least don't leave it more than a few days. Lithium batteries (and any type of rechargeable battery) work much better if they are always recharged to full. Make sure to keep you battery at room temperature to prevent the battery from draining. Unplug the battery when you are working on the motor or drivetrain. This is just good practice in case anything were to go wrong, with the battery unplugged there is no risk of electrocution. Don't put your bike upside down. Most E-Bikes have buttons and controls on the handlebars, if you put the whole bikes weight through that area you are more likely to have issues later on. Avoid overtightening bolts. If you have a torque wrench use it, most bikes will come with torque settings so make sure you keep to these. Adjust your tyre pressures to the trail and conditions. Over inflate your tyres and you'll be sliding all over the place in the mud! Don't remove the motor. We don't recommend removing the motor as cables can get pinched and disconnected when trying to reinsert the motor, we suggest you just tighten the motor bolts. Batteries are relatively maintenance free but occasional cleaning and light greasing of the plug port is recommended. When you think of bike maintenance, most people will think of cleaning their bike first. But with an E-Bike, how do you clean it? Can you spray water onto the battery and motor? Cleaning an E-Bike is actually very similar to cleaning a mechanical bike, you can use water (although we do not recommend using any kind of pressurised hose) and regular bike wash but brands such as Muc-Off have created their own range of E-Bike specific products, designed to be used without water. Remove the battery and wheels: If you're wanting to do a deep clean we recommend putting your bike in a work stand and removing both the wheels and the battery. Most manufacturers do suggest removing the battery to clean your bike but it is definitely worth checking on their website as some tell you to keep the battery in. If you do choose to remove the battery, all you need to do is cover any electrical contacts on your bike with a dry cloth. Don't worry if water does get into these parts as they are water resistant. Some manufacturers also recommend covering switches and exposed connectors with a dry cloth before washing the bike. Spray the bike from top to bottom: When spraying down the bike, try to avoid spraying directly onto the electrical components and bearings. Next you want to spray bike cleaner onto the frame, again avoiding the electrical areas to keep them as dry as possible. Brush away dirt: After leaving the bike cleaner for around 5 minutes, use a soft cleaning brush to wipe away the dirt. We highly recommend buying a set of bike cleaning brushes, they come with different sizes and bristles to clean every part of your bike. You can view our range of brushes here. Degrease the chain and cassette: Use a degreaser to give the chain and cassette a full clean. Use a stiff brush and try to get all of the grease out of the chain, don't forget to put oil back onto the chain and run the pedals round a few times to evenly distribute the oil. You can choose between wet and dry lube, depending on the time of year and where you will be riding your bike. Apply Corrosion block: Spray corrosion block on all electrical contacts after you finish cleaning the bike. Make sure to spray well on areas such as the battery, battery terminals and other metal parts, this will disperse any excess water. Corrosion block gives long term protection but during winter it is recommended that you use it more regularly. Specialized Turbo Levo Cleaning: If you own a Turbo Levo, we suggest raising the back wheel approx. 3 inches above the ground to prevent water pooling in the motor casings. 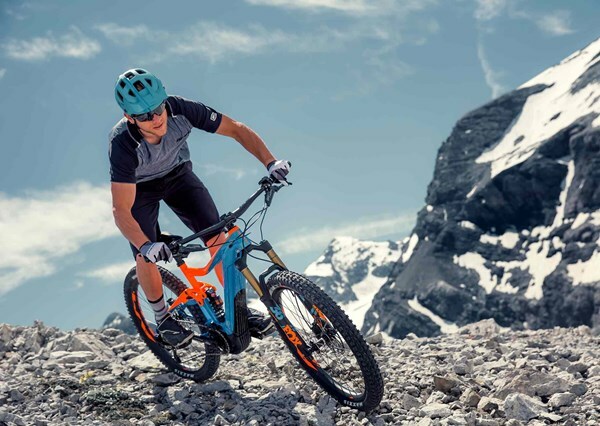 Muc-Off have recently released a range of E-Bike specific cleaning products designed to keep you E-Bike in prime condition. When transporting your E-Bike, we recommend removing the battery and covering the terminal with covers. Bosch supply a battery pin cover, find it here. If you don't want to buy the cover, a small plastic bag will do. Alongside the normal cleaning of your bike, we suggest removing the motor covers and cleaning inside every 3 months, this will remove the build up of dirt inside. Here at Rutland Cycling we have 6 E-Bike centres within our stores. At our E-Bike centres you can speak to our expert staff if you have any queries surrounding your E-Bike. We understand that it can be quite daunting to try and fix an issue with your E-Bike, that's why we offer E-Bike services and service plans to keep your bike in it's best possible shape. Pop into one of our E-Bike Centres in Rutland, Cambridge, Grafham, Histon, Peterborough, and Pitsford.